Wow! That's about all I can say after watching a game like this. A total pitchers duel, some of the best defense that you could ask for and a bullpen working out of a jam and hanging on to history. The Mariners used 6 pitchers today to beat the Dodgers 1 to 0 while allowing no hits. That's right, ZERO! Kevin Millwood started the no-hit bid going 6 innings and allowing only a walk while striking out 6. When Millwood came out to pitch the 7th, he threw one pitch, a warm-up pitch and injured his groin. A minor injury, but enough of an injury for Millwood to come out of the game after throwing only 68 pitches. True dominance. To have only 68 pitches through 6 complete is absolutely amazing, but Millwood's night was now over. The no-hit bid was still in order, but Kevin would now have to sit and watch the bullpen try and carry it out for the next 3 innings. Charlie Furbush took the ball from Millwood and got 2 outs before handing the ball to Stephen Pryor. Pryor finished off the 7th by striking out Juan Rivera. The Mariners would score the lone run of the game in the bottom of the 7th on a Kyle Seager RBI single that scored Ichiro Suzuki from 2nd base. The M's put together a 2 out rally with an Ichiro single and a Dustin Ackley walk when Seager came to the plate and knocked in his 37th RBI of the year. Mariners 1 - Dodgers 0. The top of the 8th, Stephen Pryor came back out to pitch, now being the pitcher of record since he was the last on the mound when the M's got the lead run. He walked the first batter, then he walked the second batter, then Eric Wedge walked out of the dugout and removed the ball from Pryor's hand. Lucas Luetge came into the game to face James Loney and Loney actually laid down a sac bunt to move the runners to 2nd and 3rd. The Dodgers were in prime position to score a run without even getting a hit and the game could have been tied. Instead, Eric Wedge brought in former closer Brandon League to face A.J. Ellis and Tony Gwynn Jr. Ellis took and 0 - 2 pitch from League and lined it into left, Chone Figgins came charging in to make the catch and threw a bullet to home holding Alex Castellanos at third. Then it was Gwynn. League was ready for the occasion and went right after Gwynn. On a 1 and 2 count, League threw an 89 MPH splitter to get Gwynn swinging and the inning was over, the threat was ended and the no-hitter preserved. On to the ninth inning, Tom Wilhelmsen was brought in for the save. For the first out, Dee Gordon hit a slow roller to Brendan Ryan at short and Brendan Ryan came up with the ball and fired it to Justin Smoak to try and beat out a speedy Gordon at first. Smoak caught the ball, Gordon crossed over the bag signaling himself safe as the first base umpire called him out. The play was close, but watching the replay, Gordon did appear to be out. After a little bit of arguing from both Gordon and Don Mattingly, we went back to playing baseball. Wilhelmsen got Elian Herrera to line out to Ryan and then Andre Ethier to ground out to Ackley for the final out and clinch the no-hitter. 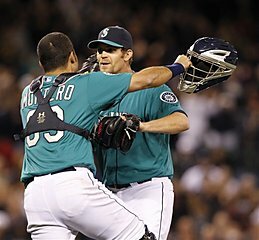 This was just the 10th combined no-hitter in MLB history and the Mariners tied a MLB record by using 6 pitchers to get it done. Erasing the memory of the recent perfect game by Philip Humber and recording history of their own and hopefully establishing even more momentum going forward. A large amount of props have to go out to Jesus Montero who caught the entire game today. A terrific job by a rookie catcher to call a game and go the distance with a myriad of pitchers and not allow a hit. Maybe he's a better catcher than anyone has given him credit for. Ichiro went 3 for 4 on the day, as the team as a whole collected 8 hits. Every single one of the hits were singles. Michael Saunders got another hit and finished the day at 1 for 4. Millwood has been better each time out and seems to be gaining momentum as the season goes on. The word on the injury is a mild strain of the groin, which means he will probably miss a little bit of time. A tremendous performance today and hopefully he won't miss too much time. Mariners beat the 37 and 22 Dodgers in the first of three games and no-hit the hottest team in baseball. Collectively, Kevin Millwood, Charlie Furbush, Stephen Pryor, Lucas Luetge, Brandon League and Tom Wilhelmsen all have something to write home about. All of them become a part of history and as Mariner fans, you gotta believe that this team is starting to catch fire. AWESOME!